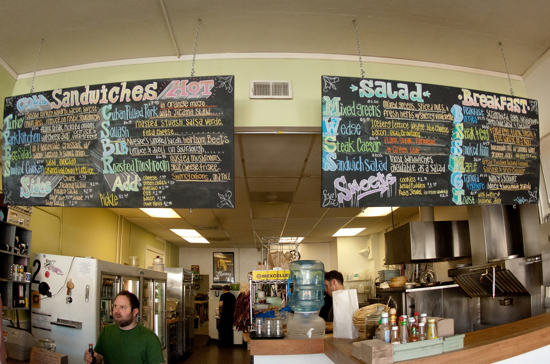 I’m a regular at Meat Cheese Bread, my favorite sandwich shop in Portland. Even though I’m sick and feel like hell, I ventured out to pick up a to-go order today, because their egg salad sandwich makes everything better. John, the owner, was working the counter. Me: Can I make a suggestion? Me: You guys should make a sweet tea. John: Because it’s disgusting. I make all the iced tea myself. Simple syrup’s over there. If you want to ruin it, go ahead. Some people would get turned off by this, others would be downright pissed. But this is exactly what I like in a business, and it’s why I eat there at least once a week. John’s singular, uncompromising vision is why the food is so damned great. He’s not trying to make a restaurant that makes everyone happy; he built a place that he’d want to eat at, and if you don’t like it, piss off. Meat Cheese Bread. Photo by Tim Roth on Flickr. The same goes for the web. I’d rather use a service that has a strong, single-minded vision, even if some of the decisions aren’t exactly how I’d want them, than a washed-out, milquetoast service created by committee, designed to meet market demand, that tries to make everybody happy. Another way to put it: if someone out there doesn’t hate your product, it’s probably not worth using. 100%. sorta in the same thread, this reminded me of randall stross’ piece in the times today. Except, for this approach to work, there must be many cafes in the street. And many twitters on the web. Also, grammar Nazi alert: “if someone out there doesn’t hate” == “if there is at least one person who does not hate (while all the rest do)”. You want stuff determined by committee? Buy a camel. Or a caramel latte. Otherwise, find someone with a vision who cares and is willing to stand firm on that score. Or at least one person who does not not care and who does not not have a vision (while all the rest do not). Have a vision, that is. Tangent: see also “the innovator’s dilemma”. 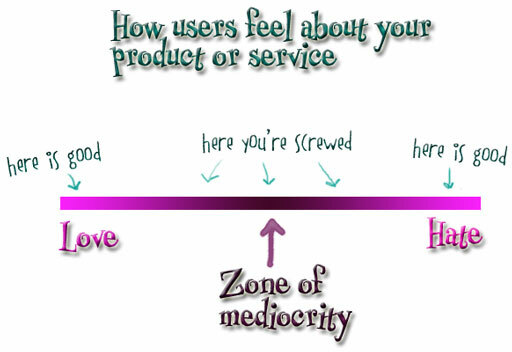 Letting your (big) customers determine where you are headed won’t ever result in something original. Right on, I totally feel this way. However, I do also share your love of sweet tea. Coming from the South, I was raised on what was basically syrup. When I hear “sweet tea” I think of Chris Hanson. Try to please someone or risk pleasing no one. My old boss phrased this kind of business/product idea in a succinct way that I still use even after he fired me. He talked about being in a foxhole as a business leader. Knowing your clientele, and catering to them, no matter what. Because when you find a group of people who believe in what you believe in, and will follow you to the ends of the earth, the WORST thing you can do is to compromise – to look for another foxhole. Of course if that guy were in the south (or Southwest), Sweet Tea would be an essential business requirement, and people would walk away (I have seen it) no matter how strong the vision. They also have my favorite breakfast burrito in Portland. I suggest it with the avocado.